Don't miss a thing With WDR - forensic capture, which preserves forensic detail when there are both light and dark areas in a scene. And Axis Lightfinder technology for sharp, color images in poor light conditions. P3375-V delivers superb 1080p image usability. A cost-efficient camera you can count on P3375-V offers remote zoom and focus for fast, easy installation, which helps keep your set-up costs down. It's compatible with all your P33 series accessories and mounts. And it features Axis Zipstream technology, which preserves important details in full image quality, while reducing storage and bandwidth by up to 50% for high-quality images, and significant savings. Plus, IK10-certified housing makes P3375-V vandal and impact resistant - and dependable. 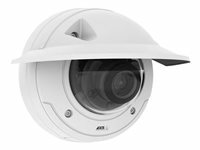 Don't miss a thing - day or night With Axis Optimized IR for high-quality, low-noise video, even in pitch-black environments. WDR - Forensic Capture, which preserves forensic detail when there are both light and dark areas in a scene. And Axis Lightfinder technology for sharp, color images in poor light conditions. AXIS P3375-LV delivers superb HDTV 1080p video usability. A camera you can count on AXIS P3375-LV offers remote zoom and focus for fast, easy installation, which helps keep your set-up costs down. It's compatible with all your AXIS P33 mounts. And it features Axis Zipstream technology, which preserves important details in full video quality while reducing storage and bandwidth by up to 50% or more, resulting in significant savings. Plus, the IK10-certified casing makes the dependable AXIS P3375-LV vandal resistant. Plenty of extras With its built-in two-way audio, AXIS P3375-LV lets you listen in to a scene and also address intruders to scare them off. 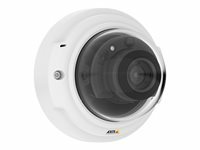 You can make your surveillance system even smarter by integrating other equipment via the AXIS P3375-LV: A sensor or detector can be connected to the camera's digital input to trigger alarms or actions, and since the input can be supervised, an alarm can also be sent if the connection is cut. A device, such as a relay to activate lights or lock/unlock doors, can be connected to the digital output and be controlled by the camera. Finally, the camera offers integrated AXIS Video Motion Detection, active tampering alarm and audio detection. Don't miss a thing With WDR - forensic capture, which preserves forensic detail when there are both light and dark areas in a scene. And Axis Lightfinder technology for sharp, color images in poor light conditions. P3375-VE delivers superb 1080p image usability. A cost-efficient camera you can count on P3374-VE offers remote zoom and focus for fast, easy installation, which helps keep your set-up costs down. It's compatible with all your P33 series accessories and mounts. And it features Axis Zipstream technology, which preserves important details in full image quality, while reducing storage and bandwidth by up to 50% for high-quality images, and significant savings. Plus, IK10-certified housing makes P3375-VE vandal and impact resistant - and dependable. 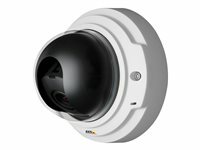 Don't miss a thing - day or night With Axis Optimized IR for high-quality, low-noise video, even in pitch-black environments. WDR - Forensic Capture, which preserves forensic detail when there are both light and dark areas in a scene. And Axis Lightfinder technology for sharp, color images in poor light conditions. AXIS P3374-LV delivers superb HDTV 720p video usability. 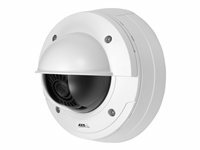 A camera you can count on AXIS P3374-LV offers remote zoom and focus for fast, easy installation, which helps keep your set-up costs down. It's compatible with all your AXIS P33 mounts. And it features Axis Zipstream technology, which preserves important details in full video quality while reducing storage and bandwidth by up to 50% or more, resulting in significant savings. Plus, the IK10-certified casing makes the dependable AXIS P3374-LV vandal resistant. Plenty of extras With its built-in two-way audio, AXIS P3374-LV lets you listen in to a scene and also address intruders to scare them off. 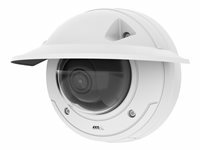 You can make your surveillance system even smarter by integrating other equipment via the AXIS P3374-LV: A sensor or detector can be connected to the camera's digital input to trigger alarms or actions, and since the input can be supervised, an alarm can also be sent if the connection is cut. A device, such as a relay to activate lights or lock/unlock doors, can be connected to the digital output and be controlled by the camera. 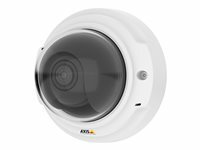 Finally, the camera offers integrated AXIS Video Motion Detection, active tampering alarm and audio detection as well as support for a wide range of advanced analytics from Axis and its partners. Don't miss a thing With WDR - forensic capture, which preserves forensic detail when there are both light and dark areas in a scene. And Axis Lightfinder technology for sharp, color images in poor light conditions. P3374-V delivers superb 720p image usability. A cost-efficient camera you can count on P3374-V offers remote zoom and focus for fast, easy installation, which helps keep your set-up costs down. It's compatible with all your P33 series accessories and mounts. And it features Axis Zipstream technology, which preserves important details in full image quality, while reducing storage and bandwidth by up to 50% for high-quality images, and significant savings. Plus, IK10-certified housing makes P3374-V vandal and impact resistant - and dependable.